A Cool Place To Read Honest Reviews! Do your kids like wearing boots? 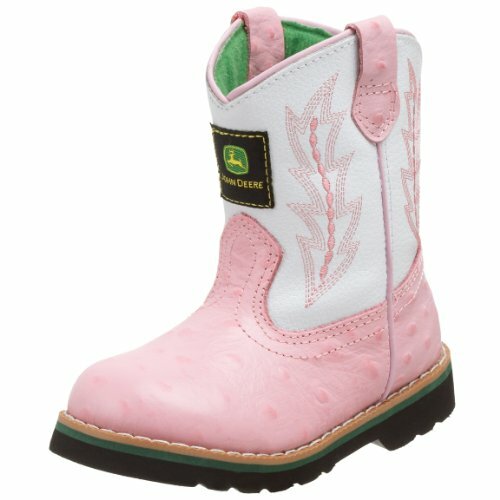 How about these pink John Deere boots for kids? They have a unique and cool looking style. They are perfect for girls and ladies to wear. I love wearing my boots even on hot summer days. Speaking of summer days, I still remember a time when I went to visit my parents in New York, my older sister was asking me why I still wore my boots instead of sandals. Doesn’t it feel hot? I told her first of all I don’t have a pair of sandals because I didn’t bring them with me. Second of all I like wearing my boots and I have already gotten used to wearing them. It doesn’t bother me with the hot weather, and besides I usually have cold feet so I need something to warm up my feet. Maybe I should have asked her if she could lend me a pair of sandals for the time being? I bet she might say I don’t have an extra pair for you. LOL….. Seriously, when I like something I don’t care what others are saying or how they are looking at me. As long as I like it that is good enough for me. Does it bother you what others say to you? This whole article is dedicated to John Deere boots for women and girls, but if you need the men and boys’ John Deere boots then you can click here for the styles. When you are there, you can select between the men and boys categories on the left side of the page. Three pretty pink boots to select for your little girl. Your baby girl is going to be thrilled to receive them. I have seen a lot of customers who bought these boots for their little girl and they were excited and love them. I wish I had received a pair of these boots from my parents. When I was a little girl, I had to wear passed down shoes and clothes. I never got to have new shoes or clothes because we have a lot of siblings in our family and I am second to last in my family. Were you in the same situation as me having a lot of siblings? There are some advantages of having many siblings though. I do feel very happy to have many siblings. No biggie, I can buy my own boots now. This is the John Deere 185 boot that is designed for kids. It is for toddlers, little kids and big kids. If you have a child that fits in that category then they have the size for your kid. There are two available colors for these John Deere boots. One of them is Tan/Pink which you can see in the picture on the left side and the other color is Turquoise/White. The height for the boots is approximately 8 inches tall. The measurement of the opening boot is also 8 inches around. It is made out of leather with cement construction. A nice John Deere logo is on the upper front of the boot. If you need the infant size you can find it by clicking here. I have to say the infant size boots look so adorable but your baby might grow out of them pretty fast. It might be better to get a bigger size. 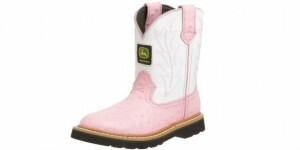 This is the John Deere Kids 171 boot and it is made in available sizes for toddlers, little kids and big kids. For this design there is only one color and it is the Chi Pink Ostrich Print White. 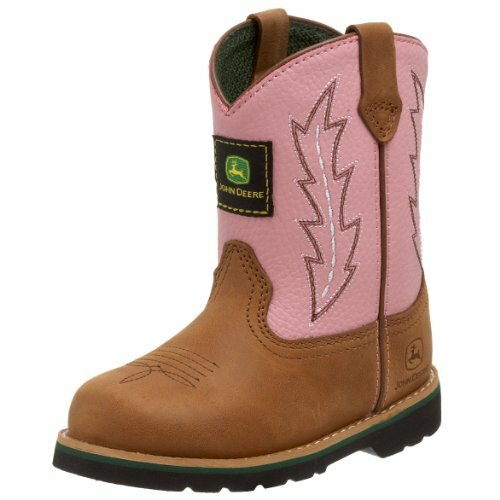 If I have to choose between the three pink John Deere boots for my kids, I would go with this one. I like this one the best. The white and pink colors of this boot go perfectly together and they make it look so natural and beautiful. Your little baby girl is going to be very happy to receive them and she is going to look great with these boots and her pink dresses. Not only dresses will look good with them. I think pants will also look nice with them. I have worn my pants and boots together. Actually, I wear boots and pants most of the time. I seldom wear dresses. I only wear dresses on special occasions. To me wearing pants is more convenient. These John Deere Kids 171 boots are made with leather and cement construction. They look very comfortable to wear. An infant size is also available for this boot design. You can check out the infant size by clicking here. The John Deere Growin Like A Weed Pull On boot is my third choice comparing to the others. You might find this boot style is your favorite because everyone has their own preferences. Speaking of preference, I have a family member who likes the opposite of everything I like. He might find these boots are his favorite and that’s why it is so hard to for us to make a decision on one thing. LOL…. Do you have a family member like that? It is not that I don’t like these boots. It’s just that I would select the other ones first before these. I don’t think they have these boots in an infant size because I can’t find them. The color for these boots is Pink/Turquoise. The shaft height for this boot is approximately 5 inches tall. 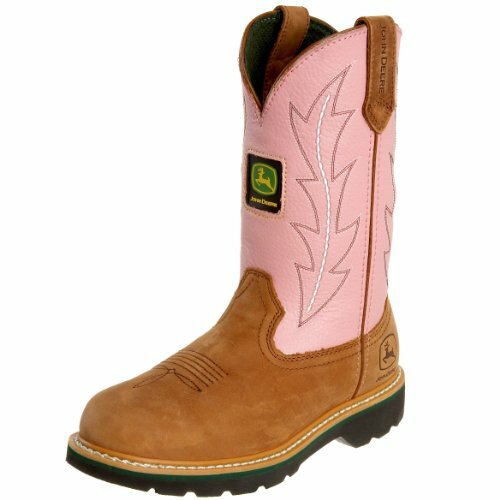 I only came across one pair of pink John Deere boots for women in my research. I don’t know if they are going to make any more John Deere boots in the future. They do have other designs of ladies John Deere boots. 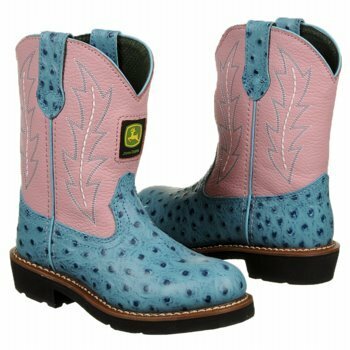 To see more different styles of John Deere boots for women please click here. The John Deere Wellington boot looks exactly the same as the John Deere 185 boot in terms of style. It does have two other color styles to select from and they are Tan/Green and Tan/Camo. The picture on the left color is Tan/Pink. This John Deere Wellington women’s boot is built to last with its durable high quality and strong leather and canvas. It is excellent for outdoor activities such as hiking. You do need a pair of comfortable shoes to do outdoor activities. The measurement for the boot opening is 12 inches around, the shaft is 10 inches from arch, the platform is 3/4 inch and the heel is 1 1/4 inch. Do note these measurements are approximate. I think the heel high is just about right. You don’t want to have heels that are too high, especially if you are walking a long distance. You would want something as flat as possible to stay comfortable. You don’t want to have a blister or feel pain on your feet. All I know is I had a pair of sneakers that gave me a lot of pain. One of my toe nails turned black and eventually my whole toe nail peeled off. If you are wondering if your finger nails or toe nails are going to grow back, the answer is yes. I was asking the same thing. I was really worried that it wouldn’t grow back. Luckily it did. So don’t buy a pair of shoes that you are not comfortable with. Pick My Reviews is a participant in the Amazon Services LLC Associates Program, an affiliate advertising program designed to provide a means for sites to earn advertising fees by advertising and linking to Amazon.com.